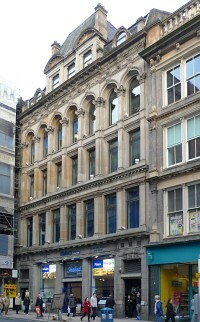 Mackintosh made drawings for internal alterations to these premises, and Honeyman, Keppie & Mackintosh were paid by the client, but there is no record of what work was carried out. The drawings suggest that this was a shop-fitting job, which did not involve structural alterations. Authorship: Several of the surviving drawings are clearly in Mackintosh's hand and are extensively annotated by him.